Researchers: Xiaopeng Tong and David T. Sandwell, Scripps Institution of Oceanography, University of California, San Diego, Bridget Smith-Konter, Department of Geology and Geophysics, University of Hawai‘i at Mānoa, Honolulu. Earthquake hazards along the San Andreas Fault System (SAFS) can be assessed from fault slip rate estimates. 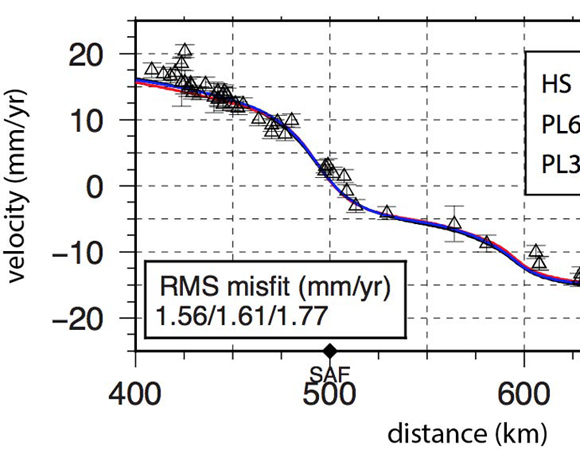 Estimates of slip measured by the long-term offset of physical geologic features along the fault do not always match modern estimates from precise positioning GPS measurements. Using a viscoelastic layered earthquake cycle model that simulates interseismic strain accumulation, historical earthquake ruptures, and postseismic stress relaxation over several hundred years, slip rates of the SAFS are beginning to reconcile. 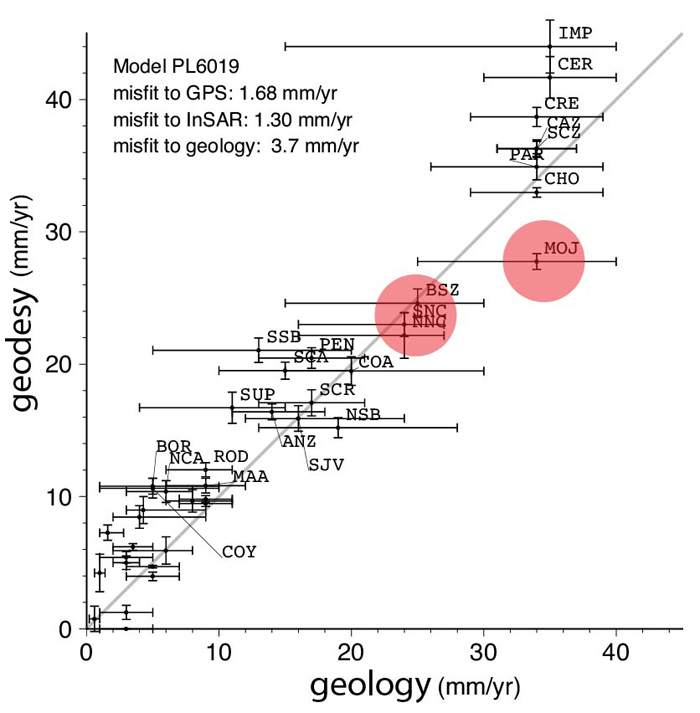 Comparisons between geologic and GPS slip rate measurements from different timescales can ultimately improve our understanding of earthquake mechanisms and reduce risks. Slip rate is a measure of how fast one side of a fault moves past the other side. A geologic slip rate is determined by measuring the offset of geologic features across a fault that may take place over very long timescales (e.g., thousands to millions of years). A geodetic slip rate is determined by measuring ground motion on either side of the fault over short timescales (e.g., about 10 years) using GPS and/or satellite radar interferometry. Estimates of slip rates measured by these two techniques do not always match. In particular, recent studies note a discrepancy between the geologic and geodetic slip rates on some faults of the SAFS. The geologic versus geodetic slip rate discrepancy for various fault segments of the SAFS is investigated using a three-dimensional earthquake cycle model. This model is constrained by the geodetic data, including 1,981 horizontal velocity vectors collected since 1996 and satellite imagery collected from 2006.5 to 2011. Geologic data used for the model include quaternary fault slip rates from the Working Group on California Earthquake Probabilities (WGCEP). A two-layer model with a 60-kilometer thick elastic layer overlying a viscoelastic layer provides the best fit to the geodetic and geologic slip rates for most of the fault segments in the SAFS. 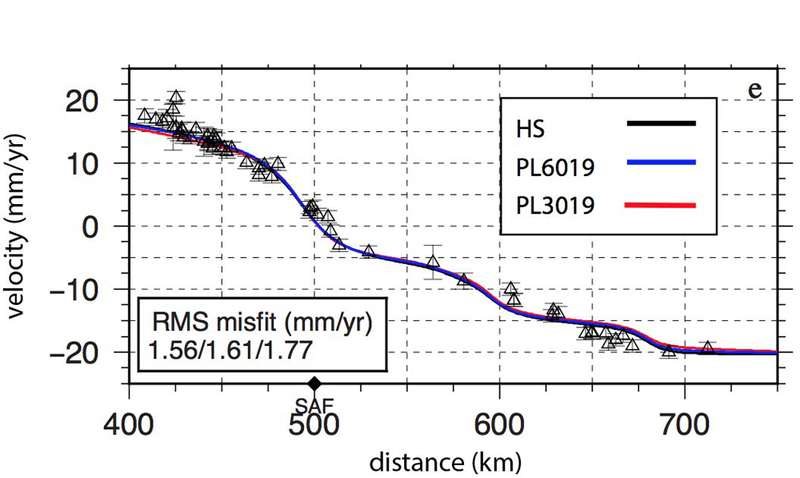 A key observation of this modeling is that the rate of slip varies depending on how long it has been since a large earthquake. Soon after an earthquake the slip rate is higher and long after the earthquake the slip rate is lower due to viscoelastic rebound. Other factors that affect the slip rate over time are the viscosity of the crust and upper mantle and the thickness of the crust. It is clear that geodetic and geologic measurements of slip rate are important. Reconciling any differences in these measurements yields information about the structure of the crust and upper mantle and the characteristics of the fault in time and space. 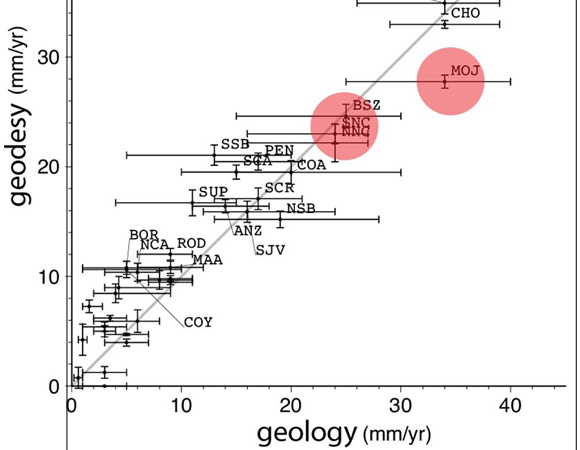 References: Tong, X., B. Smith-Konter, and D. T. Sandwell (2014), Is there a discrepancy between geological and geodetic slip rates along the San Andreas Fault System?, J. Geophys. Res. Solid Earth, 119, doi:10.1002/2013JB010765.